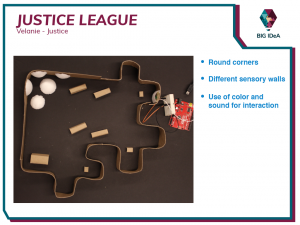 Our first hackathon was a blast! We loved seeing how quickly teams took to breaking down and solving these real life challenges. A big thank you to all that attended and we hope you had as much fun as we did! 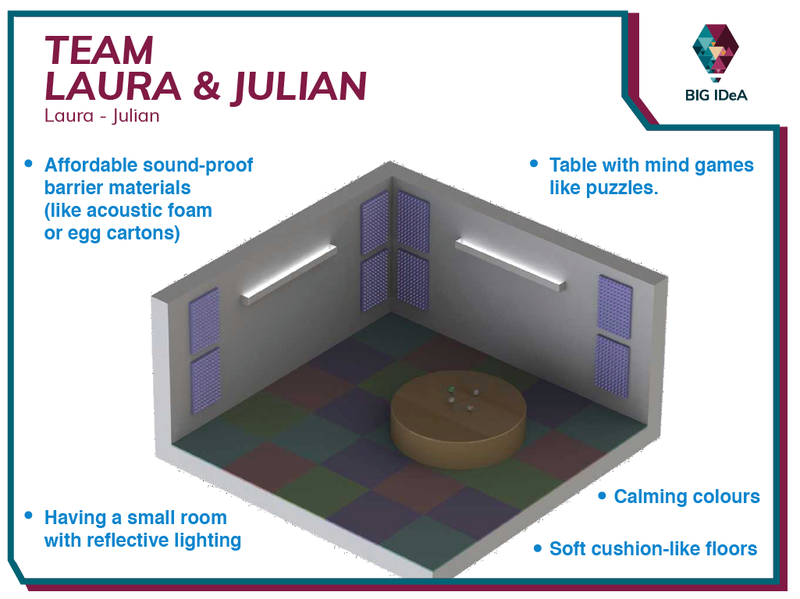 For people with autism; how would you create a separate space in a room with minimal materials that could be a “chill out” space if a theatre performance became too overwhelming? 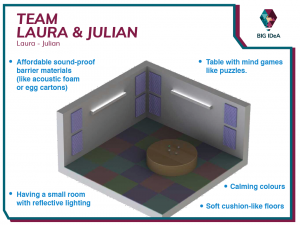 Having a small room with reflective lighting, calming colours, soft cushion-like floors, affordable sound-proof barrier materials (like acoustic foam or egg cartons), and a table with mind games like puzzles and rubik’s cubes. 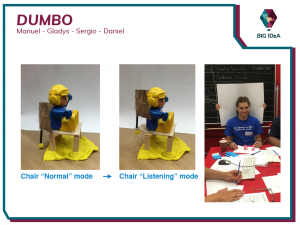 Create an environment where a performance can be enjoyed on a smaller, less intense scale. Patrons spend too long waiting for Wheels-Trans buses and miss their buses frequently due to communication and location issues. 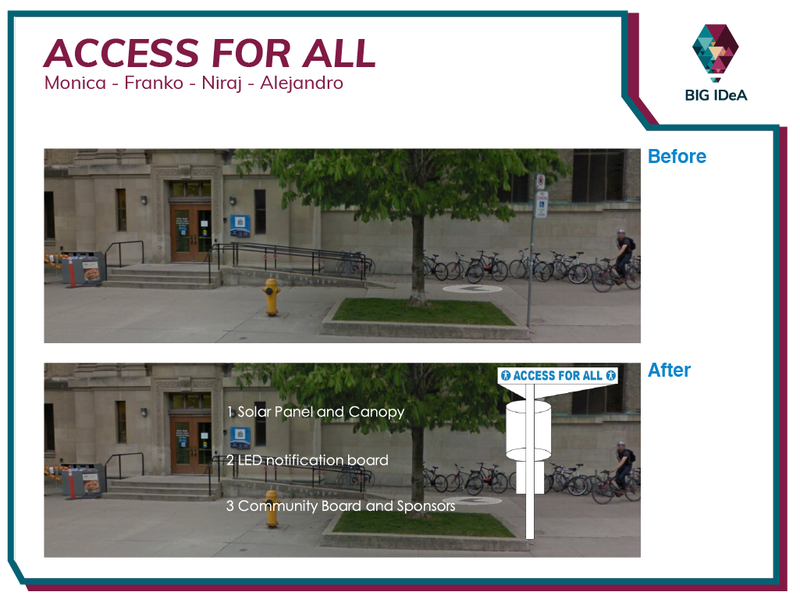 Awareness campaign, solar powered light posts to improve visibility of stop sign, and a mobile app that sends arrival notifications to and from drivers and users to enhance user experience. 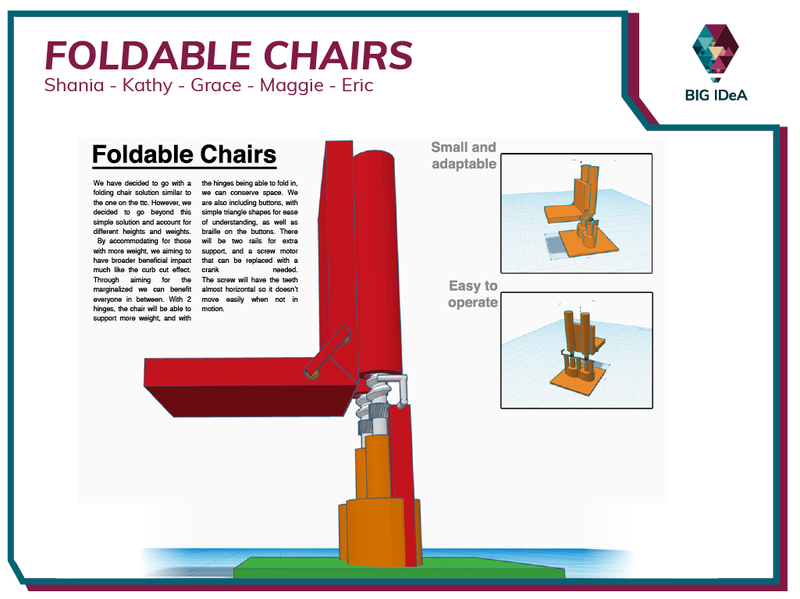 What is a sturdy design for a transfer device that could be installed permanently or as needed in public washrooms? 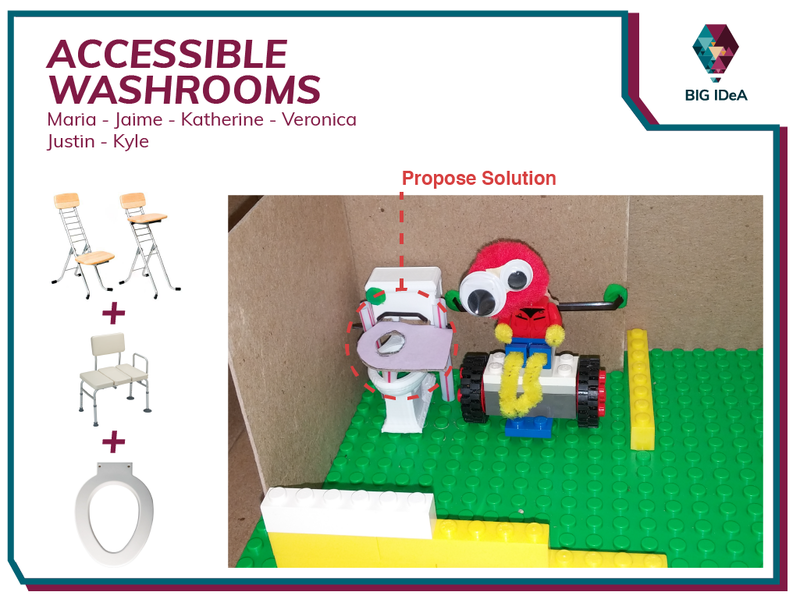 A transfer device made by redesigning the toilet seat and the support system in accessible washrooms. 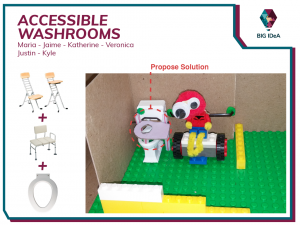 Thus improving mobility between toilets and wheelchairs. How do we provide a space to sit in our very small lobby area for those who cannot stand for long periods of time in between performances? 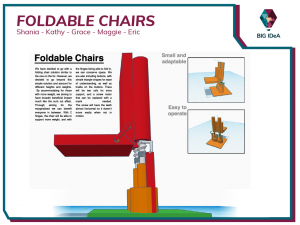 Create a height adjustable foldable chair to be mounted on a wall. Hence, conserving the walkable space in the small lobby while allowing for patrons to sit and relax. 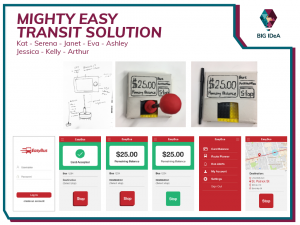 How can an overall transit experience (Payment, stop Request, stop announcements) be made more accessible for those with muscular dystrophy? 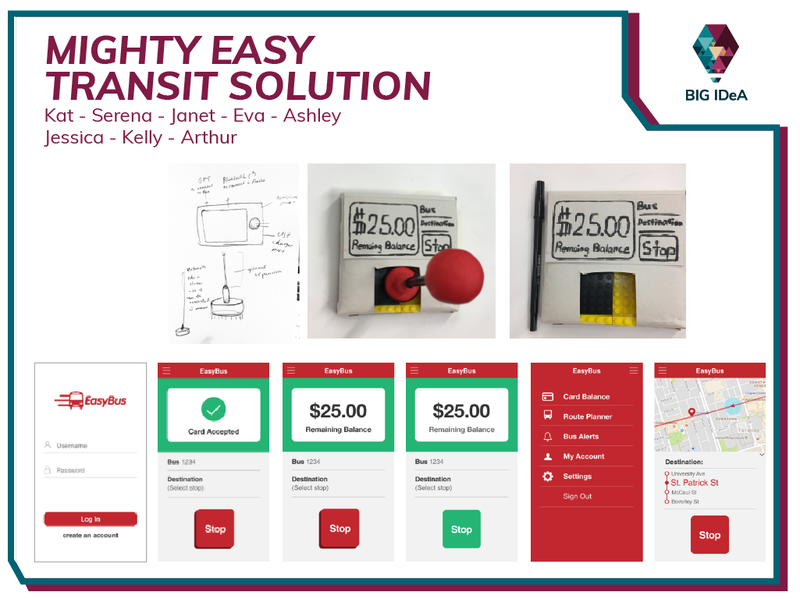 A transponder app (including a low cost hardware) that streamlines payment, trip announcements, and stop requests by incorporating Bluetooth, GPS, and E-Commerce technology. What are simple solutions to help guests at a table to hear each other and enjoy the music and energy around them? How can this solution be an unobtrusive part of the decor? Redesigning the back of a chair to include a curved adjustable back piece so patrons can control the intake of the sounds and visuals in their surroundings.